News websites are competing to cover the Trump presidency with the most accurate and impactful storytelling. Here are some of the best bits from Trump’s 100th day coverage. Here we are. The Trump administration has celebrated its first 100 days in office and American news publishers did not miss this emblematic opportunity to highlight the best of their digital journalism. Here are some of the best ideas I came across — whether it consists in product innovation or just in refreshing story angles. This list is in no way exhaustive — I would be happy to hear your suggestions on Twitter or in the comments section below. Among outstanding all-rounders, The Guardian put together what is surely the most concise and most dynamic summary of Trump’s 100 days. The feature is filled with charts and timelines which stick to the bottom of the screen and update while scrolling. It also works remarkably on mobile, if you have a large enough screen. 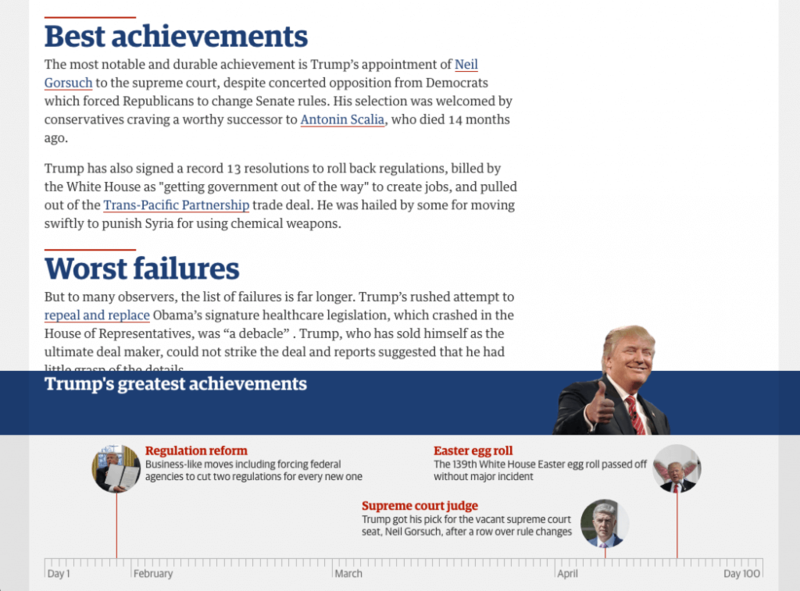 The New York Times gathered a daily timeline of its Page One headlines about Trump and compared them with those of Obama and Bush: a compelling idea despite the lack of graphic elements. CNN made a clear analysis of Trump’s image overseas, with a handy nav-bar that allows the reader to jump from one country to another. 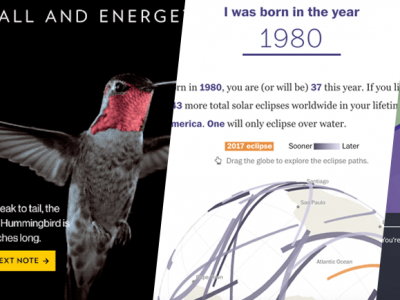 In the aftermath of the election, publishers wholeheartedly pledged to devote more resources to on-the-ground reporting. 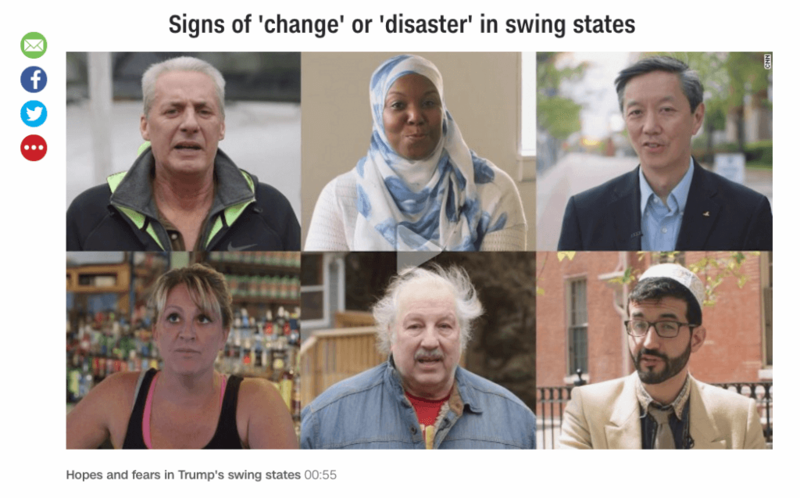 Among good examples, here is this series of Pennsylvania-based articles from The Guardian (with a nice branding effort), or the these video portraits from CNN. The need to strengthen the relationship between journalists and readers also led to several great ideas, such as this text-only article from The NYT which surfaces dozens of comments from readers explaining how Trump influenced their own lives. The Washington Post listened to its readers as well and built an interactive feature about their most cited words. In an unusual view from behind the scenes, the Times also asked its White House reporters to describe their favourite Trump anecdotes: a simple way to humanize the newsroom. When it comes to bolder stories, Politico proved to be talented with an alternative ranking of Trump’s first 100 days, from the most thrilling to the most boring (I love the clever analogy with TV shows). The Guardian bet on geeky humor with a list of the best memes found on social media. BuzzFeed went even more creative by assigning 10 writers to pen a 100-word reaction to Trump’s early steps. Meanwhile, Mashable published a sharp quiz that mixes genuine and fake anecdotes about the last 100 days — I dare you to find them! Finally, it would be unfair to forget widespread formats like fact-checking, which some publishers are now excelling at. 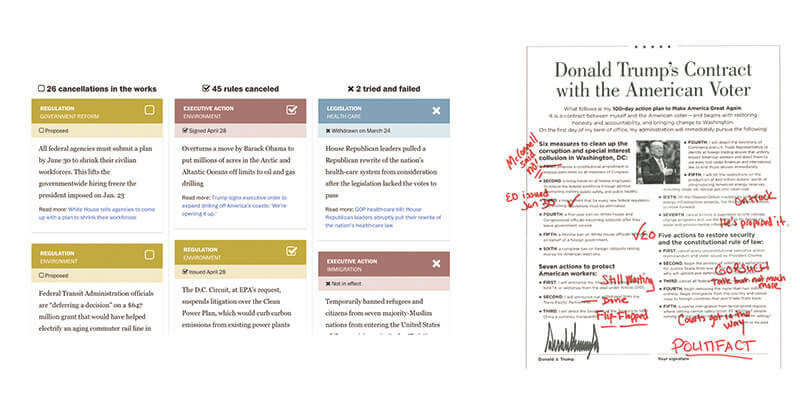 The Washington Post showed particularly comprehensive with: an extensive database of Trump’s public claims (which you can explore with granular options, despite a somehow intimidating design), a great follow-up on Trump’s campaign promises, and a clear assessment of Trump’s efforts to dismantle Obama’s legacy. I also liked Vox’s annotation format which provides a legible counterpoint to one of Trump’s general-policy speeches. More impactful, Politifact had the genius idea to scribble an official leaflet which listed Trump’s top priorities. 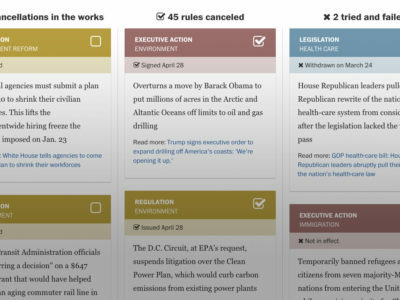 Left, an intuitive list of anti-Obama measures by The Washington Post. Right, an official leaflet annotated by Politifact. An award should also go to The New York Times which managed (as usual) to cover this political landmark with a large variety of stories, often clever and previously unexplored. Some personal favorites: a very clear analysis of Trump’s main policy moves, and a great catalogue of POTUS tweets. However, The Times could use a better navigation system for longforms — scrolling endlessly can be painful. No one is perfect! Other ideas? Share them with me on Twitter! Read the original version of this article in French. I'm French and I love digital media (a lot). Currently Mobile Product Manager at Le Figaro. Graduate in Media Management (Sciences Po Rennes) & UX Design (Gobelins Paris).